We’d love your help. 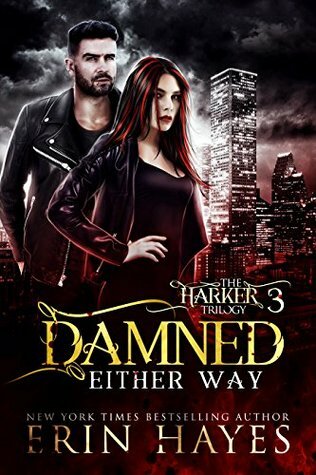 Let us know what’s wrong with this preview of Damned Either Way by Erin Hayes. I'm finally free of my family's curse. Anthony, the vampire that killed my sister and my brother-in-law, has won. I've lost everything. I no longer have my powers. I have no idea where Amelia is. And the vampire I love has surrendered to the hunger that is throwing the world into chaos. The worst part? I can't do anything about it, because I'm no longer the Harker. Sure, I'm not dying anymore, but I'm barely living at this point. To ask other readers questions about Damned Either Way, please sign up. This was the third and final book in the trilogy, so even though I wasn’t blown away by the first two, I wanted to read this one because I wanted to know how everything would end, especially after the way the second book ended. It was interesting seeing the fallout from the things that happened in Book 2, and I thought the plot was once again solid and unpredictable at times, albeit pretty slow-paced. As for the characters, their voices sounded a little stronger this time, so that was good. But, maybe because the first person POV didn’t work for me and I never got that invested in them in the earlier books, I still didn’t feel that much for them. I didn’t dislike them though—they were still characters you could root for. I was glad the disability stayed realistic through to the end since I was still concerned it might be cured with magic. And Edie still had her scars. So overall, not a bad series—it had some unpredictability and surprises that I appreciated, and the plot was good—but I guess it wasn’t quite for me since I never really felt much depth or emotion from the characters. Anyone who likes plot-focused books may enjoy it more though. Fans of Books 1 and 2 in Erin Hayes's Harker Trilogy. Anyone who likes urban fantasy, vampires, and unpredictable plots. Oh my God!! I don't want it to be over!! I just loved this series. The family unit, the love they had for each other! Just about broke me when I thought Edie and Jude weren't going to have a life together but then they did!! She had to die, but, eh, a small sacrifice, lol. Just the best!! Way to go Erin!! I couldn't put it down. Just devoured it!! *sods* I can't believe it's over. Can we have a spin-off series, please? I'm not ready to say goodbye to these characters. In the devastating finale of Damned if I Don’t, Anthony murdered The Progenitor and rejected the Void which resulted in chaos and destruction. With the evil of the Void let loose, vampires who had once lived peacefully with humans have submitted to their feral nature and uncontrollable thirst. Jude also falls victim to the effects and is forced to go on the run rather than hurt those he loves. Despite being cured of the virus that was killing her, Edie has lost her powers and is no longer The Ha In the devastating finale of Damned if I Don’t, Anthony murdered The Progenitor and rejected the Void which resulted in chaos and destruction. With the evil of the Void let loose, vampires who had once lived peacefully with humans have submitted to their feral nature and uncontrollable thirst. Jude also falls victim to the effects and is forced to go on the run rather than hurt those he loves. Despite being cured of the virus that was killing her, Edie has lost her powers and is no longer The Harker. To top it all, Zhi and Maria are dead and to Edie’s heartbreak, Graeme succumbs to his horrific injuries sustained at the hands of Anthony and dies leaving Amelia to the his mercy. With the help of Carl’s growing powers, Edie is able to visit Meghan in the Void and discovers that Amelie is alive. Meghan tells Edie that their only hope is to find a direct descendant of Anthony’s who is willingly to take on the mantel of The Progenitor. However first they need to find out the identity of Anthony’s new familiar. Just as the situation seems hopeless, a familiar face returns to lend a helping hand. Li Zhang wants nothing more than to avenge her sons death and rid the world of Anthony. As Edie and her team make their way to Austin to rescue Amelie in an epic final showdown with Anthony, the odds seem stacked against them. Will good triumph over evil? The third and final instalment in the Harker trilogy was every bit as thrilling and gripping as it’s prequel. The situation seems hopeless at first and it seems that our two protagonists will never have their happy ending. Thank goodness for the epilogue is all I’m going to say. I was surprised at how emotionally invested in these characters I was by the third installment. Prior to reading the epilogue I found myself crying. This is a testament to the excellent writing skills. I’ve really enjoyed this trilogy and recommend it to fans who love urban fantasy with a dash of vampire/slayer and witchcraft thrown in. An ending that seriously genuinely had you wondering how it would be played out. How it would be ...ok again? The world was, frankly a mess. A disaster zone and dangerous to just live all thanks to Anthony. Yes Edie and co are en route to try to stop him but we know it's going to be hard. And with the way the last book was the thoughts going thru your head are things like "can she actually stop him? Who else will be lost? " ...and the main thoughts of Amelia? And Jude? T An ending that seriously genuinely had you wondering how it would be played out. How it would be ...ok again? Edie did not have it easy in this tale. She had a lot of weight plonked on her shoulders at a time when she hadn't been prepared as her sister was meant to be The Harker and pass it down to her child etc. This starts off the whole jumble of nightmares that makes this trilogy a really great read. Yes there's a lot of loss...but I don't think that's where the author wants you to look. The relationship between Edie and Jude is the focal point. Edie is an exceptionally strong character. And very much so for a female. But she believes she mustn't have friends or anything else or the vamps can use them to get to her. This is possibly her one flaw. She's very stubborn when she gets a thought in her head. It's not really until the last book she begins to understand she can accept help and not look weak - her fear. The characters are written very well. They help you return to the book and to immerse yourself in what is essentially Armageddon!!! A great ending to a wonderful trilogy. Ms. Hayes has built a believable cast of characters that the reader comes to care about. And, she has wrapped up the story in a manner that leaves the reader satisfied. Too many times, it seems like an author gets to the end of a series and then just throws something out there to bring it to an end. Not in this case! Anthony has killed the Progenitor and taken his place, turning the world into a horrible apocalyptic mess. Vampires are running rampant with a A great ending to a wonderful trilogy. Ms. Hayes has built a believable cast of characters that the reader comes to care about. And, she has wrapped up the story in a manner that leaves the reader satisfied. Too many times, it seems like an author gets to the end of a series and then just throws something out there to bring it to an end. Not in this case! Anthony has killed the Progenitor and taken his place, turning the world into a horrible apocalyptic mess. Vampires are running rampant with a fierce and uncontrollable hunger, natural disasters are wiping out humankind and nobody seems to be able to stop it. Edie is no longer The Harker and her vampire love, Jude, has left to avoid hurting her. Edie's young niece, Amelia, is missing and probably being held by Anthony. Will Edie and her cousin Carl, along with another vampire hunter named Lorne, be able to save the world and rescue Amelia? This final book is full of pathos, with sacrifices being made for the good of others, battle scenes between Vampires (evil) and soldiers (good), and a little romance. I loved the way that Ms. Hayes managed to wrap up the story in a way that leaves the reader satisfied. The vampire Antony who killed my sister and her husband is currently in control of everything and I have nothing in comparison. I can't find my niece Amelia, Jude has run away to surrender the the hunger that is taking control of all the vampires across the world, and I'm no longer the Harker so can't fix any of it. Can I find the courage to take the one last chance I have left to save us all? Oh WOW. This is the last book in the Harker Trilogy and has everything looking hopeless before building The vampire Antony who killed my sister and her husband is currently in control of everything and I have nothing in comparison. I can't find my niece Amelia, Jude has run away to surrender the the hunger that is taking control of all the vampires across the world, and I'm no longer the Harker so can't fix any of it. Can I find the courage to take the one last chance I have left to save us all? OK I stumbled upon this series from an author I adore for her ability to do things out of nothing. This has been a great trip even though I was a little worried about how she would bring the Harker back from the destruction of the world. Well she does it and we have a decent time making it there. While the lost are found and remedies found, answers are given and options are taken with a few drastic measures in between. Loads is sacrificed only to be received and things for the Harker are as they OK I stumbled upon this series from an author I adore for her ability to do things out of nothing. This has been a great trip even though I was a little worried about how she would bring the Harker back from the destruction of the world. Well she does it and we have a decent time making it there. While the lost are found and remedies found, answers are given and options are taken with a few drastic measures in between. Loads is sacrificed only to be received and things for the Harker are as they have been. Yup it's worth the costs because this author is good and reliable like that and this story is worth a read. This has been one hell of a ride. From a shopping trip with her sister to the Apocalypse. I don't want to spoil the ending or give too much away, but all things considered I think this was the perfect ending to the series. bon voyage my fictional character friends you gave me several hours of entertainment. BTW the narrator Kristin James really brought her A game to this book. I thought she sounded great on the first book (the 2nd book I read,so I don't know) but this final book was just wonderfu This has been one hell of a ride. From a shopping trip with her sister to the Apocalypse. I don't want to spoil the ending or give too much away, but all things considered I think this was the perfect ending to the series. bon voyage my fictional character friends you gave me several hours of entertainment. I kept this one on my TBR for far too long, I selfishly didn’t want this trilogy to be over! This series is amazing and Erin wrote the perfect ending. I had such high expectations for this one as 1&2 were phenomenal so there was a lot of pressure to make this one live up to those and it didn’t disappoint. There’s action, explosions, adventure, love, loss and a perfect ending that I didn’t even imagine. So well written and a great finish to an enthralling series. This series was charming - interesting concept, story line, characters, etc. Cute. Could have been better, could have been worse. A fast read for vampire fans. Here's the thing: this series needs some serious proofreading. The amount of missed words, double words, punctuation errors, etc. are extremely distracting. I don't think there was a single page without errors. Amazon really needs to focus on proofing as this is just too frequent a problem. This is the 3rd & final book in thrilling series The Harker Trilogy. I'm sad to see it end as I love this series. Edie & Jude''s character's are hard to say goodbye to & I'm not ready too so I would love a spin-off series. Wow! A gripping finale that in the beginning seems hopeless & slowly burns through to create a spectacular conclusion. Epilogue is well crafted & releases a little of your broken heart. A decadently delicious read that I devoured. The series was pretty good but did improve throughout. I think you could see the high school beginnings in the relationship between the two central characters but I think you can see the adult writer in this last book. The choices were harder, as was the action. I would recommend the series but think the main readers are likely to be teens and young adults (even though I'm neither!) Good reading! This book starts with Apocalypse. People are dying, vampires are killing due to Hunger. Add to it Harker with no power, psycho new Progenitor, lover with Hunger problem, kidnapped nice and you will get Edie's new world. Will she manage to defeat Anthony? What will happen to Amelia? Join Edie and Jude in the last installment of Harker trilogy, that reveals every puzzle really slowly to a reader! I loved this story from book one until the great conclusion. I just wished I didn't have to wait for book 3. The characters are fantastic, the writing is smooth, transitions seemless. I enjoyed the ending and loved watching Edie and Jude grow. This series had everything I look for in a book. Worth reading! Perfect ending to an awesome series!!! This series had me on the edge of my seat from book one!! I love Edie and Jude’s story, and all of the supporting characters. This was an expertly written paranormal romance with loads of action, heartache, loss, and triumph. Throw in an unusual happily ever after and it’s ten stars out of five!! It can't be over...it just can't! My heart hurts to think that "The End" really means the end. What an amazing trilogy this has been. Erin Hayes--thank you for an amazing ride. Edie ❤Jude 4 Ever! (I voluntarily reviewed an advance reader copy of this book and loved it!) It can't be over...it just can't! My heart hurts to think that "The End" really means the end. What an amazing trilogy this has been. Erin Hayes--thank you for an amazing ride. Edie ❤️Jude 4 Ever! What a wonderful ending!! In some senses I knew what would happen and in others I was completely caught off guard! I'm so glad it ended on one hand but on the other totally bummed its over! Great trilogy and a great read! The final book in this trilogy was the best. She really did an awesome job tying it all up. Lots of action, some magic, a taste of romance, and a great ending. It was slow to start and the middle just wasn't taking off, but the ending was great and the ending satisfying. I enjoyed the series!